Archbishop Martin praised Pope Francis but says he hopes the pontiff will speak "kindly but frankly". THE ARCHBISHOP OF Dublin has said that Pope Francis will not be able to provide all the answers to questions people will ask about scandals in the Catholic Church when he visits Ireland next week. 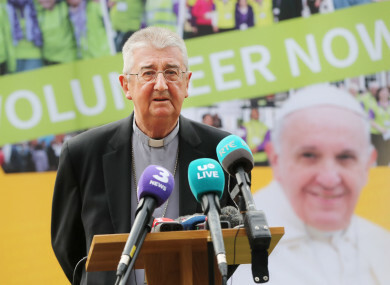 Speaking at mass today, Diarmuid Martin said the Pope “has to speak frankly about our past but also about our future” as the pontiff visits an Ireland where “scandals of abuse in the Church have produced a deep-seated resentment among believers”. Pope Francis will touch down in Ireland next Saturday for the World Meeting of Families, with a speech at Croke Park and a mass in the Phoenix Park on his itinerary. His visit comes against the backdrop of decades of scandals surrounding abuse of children within the Catholic Church in Ireland, as well as recent revelations on the cover-up of abuse in the US. Former President Mary McAleese added to the debate yesterday, when she said that the cover-up of Church abuses was “systemic” and “directed from central command and control”. Approaching the Pope’s visit, Archbishop Martin said today that Francis comes at a “complex horizon of our Irish Church”. “It is not just anger over the horror of abuse, but an anger at the role of Church leadership in compounding the suffering of so many in institutions for children, for unmarried mothers and for vulnerable women,” he said. These were people who found themselves placed in the care the Church to be loved and respected but who so often encountered extraordinary harshness. Martin said that the number of victims is immense and that we “still only know the identity of some”. He said the anger directed at the Catholic Church wasn’t just about the abuses, but also the authoritarian, autocratic and self-protecting nature of the Church. Rather than bringing the liberating message of the love of God, it imposed a world of rules to such an extent that it lacked respect for the personal life of many and especially of women. Martin said that, during Pope Francis’ short two-day visit to Ireland, he won’t be able to answer all the questions but added he hopes that the pontiff “will speak kindly but also speak frankly”. Email “Archbishop Diarmuid Martin: 'The Pope has to speak frankly about our past'”. Feedback on “Archbishop Diarmuid Martin: 'The Pope has to speak frankly about our past'”.